The LV12 chain hoist controller is designed to withstand the rigours of touring and staging life. The LV12 is contained in a steel rack mount case built with highly serviceable sub-assemblies. The Outboard LV12 is designed to operate twelve low-voltage controlled chain-hoist motors in staging and rigging applications. Whatever your production size or scale, the Outboard 12 Way LV Motor Controler will help you deliver your rigging requirements quickly and easily. Production Hire own a state of the art Outboard 12 Way LV Motor Controller for dry hire to support your live music event. 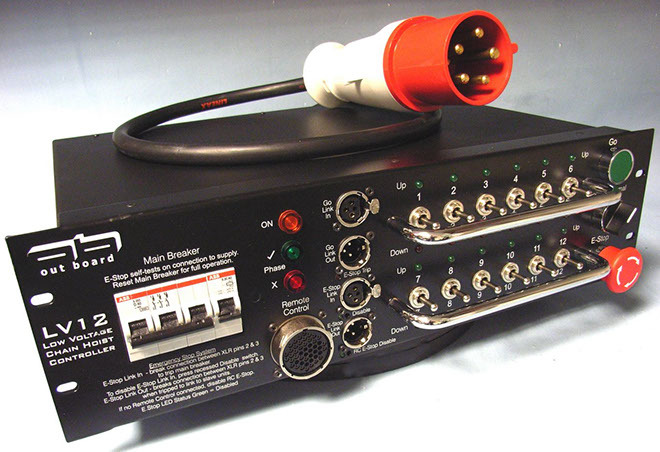 Call or contact us for your free no obligation quote regarding Outboard 12 Way LV Motor Controller dry hire. One of the Production Hire team will be happy to help.